Reloading your spent cartridges and shotgun shells is a great way for gun enthusiasts to save money over a period of time. Whether you already have a reloading press and need a more dedicated area to work or you’d like to get your area ready first, getting a the best reloading bench or stand for your money will make your life a whole lot easier. The following benches and stands are ideal for your reloading needs, providing either a multipurpose surface of collapsible work space when space is limited. What are some qualities of a good reloading bench? Can I build my own reloading bench? What’s the best way to organize my reloading bench? 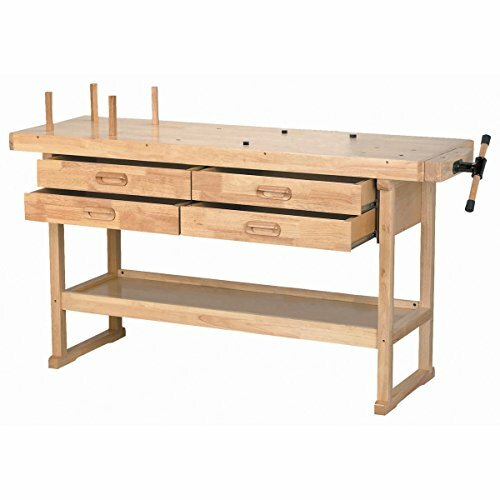 This solid workbench is designed to take a beating and is a perfect multi-purpose table for reloading enthusiasts. The 1.5 inch polyurethane-coated top is made of solid wood that can handle the mounting of everything from vices to heavy presses. With two-lock, three-inch rolling casters, the table may be easily repositioned, or it may be attached to the wall of your workshop for added stability. Overall, the workbench measures 37.4 by 48 by 24.7 inches and is built of industrial-strength powder-coated steel with a weight capacity of 1,000 pounds when evenly distributed. Two steel drawers on commercial-grade ball bearings completes the setup by adding plenty of storage space. There is a lot to love about this table, not the least of which is the price. With easy-to-follow instructions, parts orientation stickers, and simple assembly, most will find themselves able to begin use shortly after the table’s delivery. Some of the unexpected extras, such as grip mats and under-shelf lighting, are a nice touch. This is a popular reloading bench because of its large size, sturdiness, and flexibility, with uses ranging from light work to reloading and even industrial use. As expected with a large, heavy item, most complaints regarding this table are related to shipping. Owners have noted that in a few cases, the container was handled roughly and the wood surface was damaged upon arrival. In a couple other instances, parts were missing. Be sure to purchase this table from a certified or reputable dealer to help avoid these problems. Sometimes you need a reloading stand that fits into a smaller space or corner, and at 39 by 26 by 24 inches, this stand fits the bill. The powder-coated steel tripod design and rubber-tipped legs help provide maximum stability, even on carpeted surfaces. Along each leg are eight mounting holes to allow for adding a number of accessory racks, bins, or shelves. A steel shelf with two bench plate receivers provides more secure storage, while the top incorporates the Lee Bench Plate System with a pre-drilled base block to allow for any Lee press (here’s my favorite) to be fitted quickly and easily. One storage bin is included with a steel bin bracket to allow you to get started immediately. Owners of non-Lee presses love the fact that there is a universal press attachment which allows them to use almost any press. They also frequently compliment the stand on its compact size, customizability, and sturdiness. 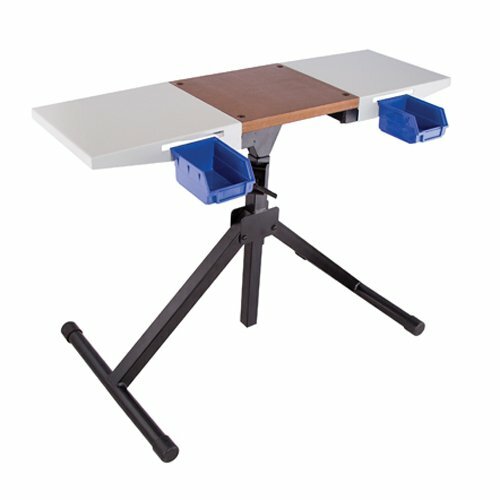 The ability to add extra shelves or bins makes this a good standalone workstation once the additional components are purchased. Known more for their presses, Lee currently offers what many believe to be the best reloading stand in the biz. The complicated assembly instructions may leave some scratching their heads, and swapping out components requires some patience. Some who have purchased this stand have also complained that a counterweight block was not included and that shelves or a nearby table is still required for reloading. It’s also worth pointing out that some of the older Lee press models may not always compatible with the pre-drilled holes. 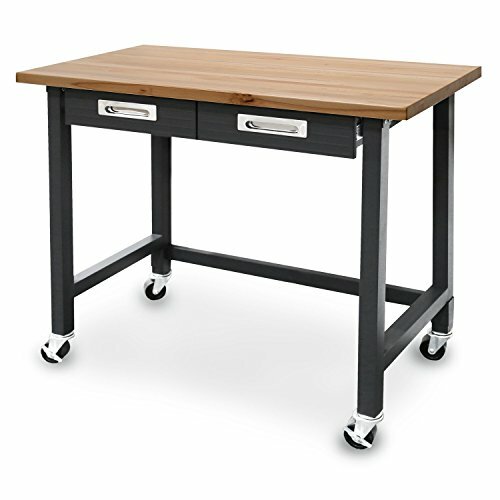 Measuring at 60 by 20 1/8 by 33.25 inches, this large lacquered wood workbench has plenty of space for all your needs. Four 25-pound capacity drawers each measuring 3 by 21 by 12.75 inches are felt-lined for easy storage of components and supplies. A bottom shelf allows you to store measures, spare presses, and other large tools. Removable pegs may positioned at various points of the top surface to help hold tools in place. The top can hold up to 250 pounds and is large enough to hold larger presses. Consumers have noted that the table is good quality for the price. Assembly is easy, even though the instructions are a little vague, and many owners have recommended wood glue to make the final bench more stable. A large percentage of people who purchase this table have customized it, replacing or adding drawers, filling in the peg holes if they want a solid surface, and adding reinforcement for more heavy-duty use. A few owners have complained about the drawers opening only two-thirds of the way. Others had minor complaints regarding shipping. To keep weight down, parts of the table are solid wood, while others are pressed wood, making it more prone to damage from poor handling than an oak or metal table. Some owners received this workbench with the box ripped, dented, or punctured. Fortunately, it is well-packed and any type of damage to the product is a rarity. Also, if you ever plan on wanting to install a bench vise, you’ll want something a bit more heavy duty or go the “build your own” route. Designed with limited space in mind, the Platinum Reloading Stand is designed for small spaces while also providing an adjustable working area. The stand has three panels, giving it a width ranging from 13 by 12 inches up to 39 by 12 inches. Its height is also adjustable from 28.5 inches to 48 inches to allow for either sitting or standing. A 1.5 inch steel frame opens up to 34 by 21 inches for a sturdier work surface. With its central wood section, two side panels, and two side bins, this stand has plenty of space for all of your reloading tools and accessories. Many will appreciate the compact storage size making it one of the best options if you live in an apartment. Available at a relatively low cost, the quality for such a compact stand has surprised some users, who have expected a lot of wobble. The adjustable height has also pleased many owners, who have used everything from stools and chairs to standing positions with equal comfort. Due to the size and portability, this table is not as sturdy as more permanent ones. Some users have noted that it becomes wobbly when working with heavier ammo, and a few have noted it’s not really suitable for large rifle cases. The central surface is also too small to directly mount the largest presses, such as the Dillon Strong Mount, which must be clamped on instead. The most important quality in good reloading bench is strength and stability. Full-length resizing and operating a multistage press requires serious leverage, and a bench that moves will be a headache. After stability, you will want a bench larger enough to provided enough space to keep all your equipment and accessories handy. Building a reloading bench isn’t too difficult, even if you don’t have any carpentry experience. In fact, building a bench yourself may be a better option, as you can customize it however you like. You can find reloading plans online for free, or at minimal cost. Gunloading.com has a good guide on building a custom reloading bench along with other info for gun enthusiasts. YouTube is also a good resource for ideas as well as how to learn basic carpentry skills. When choosing a design for your reloading bench, consider everything you will want to have on your bench and where you will want it located. If you need extra room to mount a vise, you can do that with a custom bench. Taking time to really think the design through before you start building will result in a bench that will be more functional. A messy bench will be a hindrance to fast and accurate reloading. Stackable drawer organizers of various design and sizes are a great idea for storing reloading equipment. Just like a well-organized tool chest, the drawers can be used for organizing virtually all of your reloading equipment. This includes different caliber dies, shell holders, powder measures, miscellaneous tools like trimmers, cleaning agents, ammo casings, ammo boxes and safety glasses.